Commenter Mudson has spent his life in fear of the glory that is turn based role-playing games. Now he's overcome that silly fear and wants to know what he's been missing in today's Speak Up on Kotaku. I've been playing Chrono Trigger recently. I was a late gamer starting with the Gamecube so I missed out on many of the SNES gems that defined Nintendo. Over the past few years I was looking to rectify that playing the likes of A Link to the Past, Super Metroid, Super Mario Land etc. but I have avoided the RPGs that everyone praise so highly. My problem is turn based battling. I hated it and wouldn't go near a traditional RPG to save my life (the odd exception being Pokémon, that turn based system worked for me.) Gradually over the years though I've finally gotten over this irrational fear and I am so glad I did. 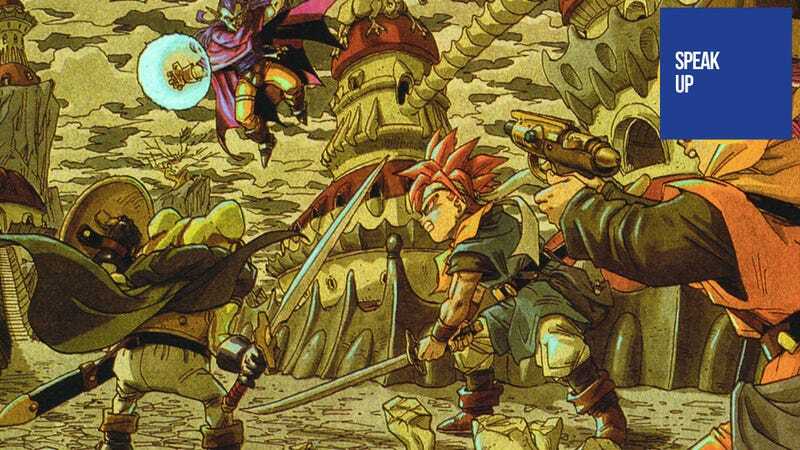 Chrono Trigger is AMAZING. The story, the music, even the battle system which a few years ago I would've hated I now love to pieces. I'm not sure what changed but I'm happy it did because I almost missed out on one of gaming's greatest feats. So my question to you Kotaku goers is what other gems has my irrational fear of turn based systems made me miss over the years? On my list so far are a few of the Final Fantasies (7 and 8 in particular) and Secret of Mana (because I found out its real time not turn based.) But are there any other games that that I should play which are as great as Chrono Trigger and my naivety caused me to ignore up until now?